PHOTOGRAPHER: It’s for a story about Vanessa and Matt’s Honey business. 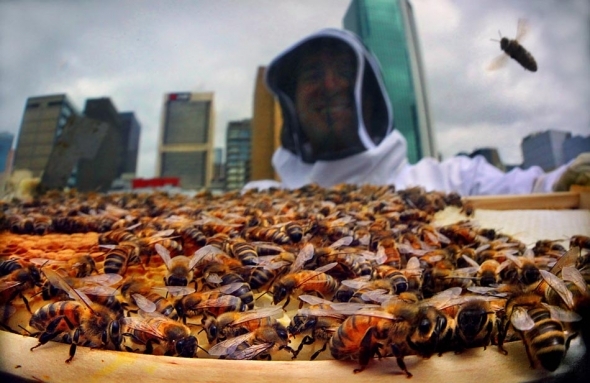 The two have set up hives on rooftops around Melbourne’s central business district. That’s something quite unique so it was important to try to capture that aspect. PHOTOGRILL: What hacks did you use? PHOTOGRAPHER: I had to find a way to get close enough to make the bees the central part of the photo, but without losing the image of Matt in his beekeeper suit, or the city skyline. That’s not as easy as it first sounds because most wide angle lenses don’t focus that close, and a close focussing macro lens will have a very narrow backround and probably blurr it completely. So I had to create a close focussing wide-angle lens for the job. I tried a 16mm-35mm f2.8, and a 15mm f2.8 full frame fisheye. I stuck with the fisheye which gave me the best skyline backdrop. PHOTOGRILL: How did you hack the lens? PHOTOGRAPHER: As you focus a lens closer & closer the lens elements move further away from the image plane, so I needed to mount the lens out in front of the camera. After a bit of fiddling I found that with a fisheye lens just a few millimetres forward of the camera gave the best results. All I had to do was sit the bayonette lens mount on the outside of the camera’s mounting flange. A purpose built extension ring couldn’t bee used because they’re all too deep. Another problem was that holding it in place by hand would let lots of stray light into the camera which interfered with the image. So the lens was taped on with copious amounts of gaffer tape (or ‘hundred mile an hour tape’ as an aerobatic pilot once called it). 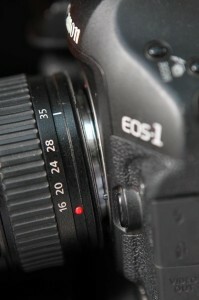 That lead to yet another problem, if you take your electronic lens off the camera you no longer have any iris control. We’d need a decent degree of ‘depth of field’. The camera would be focussed on the bees in the forground. But closing the iris down to a pinpoint would make sure that Matt the beekeeper and the city skyline were blurry, yet sharp enough for the viewer to comprehend. So Matt helped me make an iris out of cardboard with a hole made with a paper clip, which we gaffer taped to the back of the lens, (handy stuff that gaffer tape). PHOTOGRILL: What was the lens like to operate? PHOTOGRAPHER: There’s no point turning the focussing ring with this lens hack. You just sway backwards and forwards till the image on the screen is sharp. Speaking of the image on the screen, it’s dark, really dark. Normally the iris is wide open till you trip the shutter, but with this hack there is no wide open. It worked out to an aperture of about f16. Making the iris any smaller would mean a shutter speed slow enough that busy bees might be blurred through movement. Another thing you don’t really notice with this setup until you’re photographing 500 bees is how physically close you have to get to the subject. I couldn’t help the lens from nudging the bees in the front row on several occassions, which made me kind of nervous since I had just a short sleeve shirt on. I kept thinking I’d been bitten but apparently it was all psychological. 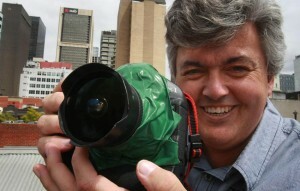 The camera was a Canon EOS 1D mk-IV. Image quality is remarkably good at high ISO ratings on this camera. So even though I was shooting at about f16, with a setting at 800 ISO the shutter speed would be 500th of a second, so there was a chance of capturing a bee frozen in flight, which did happen. I just wish he was sharper, but bees don’t take well to being directed. PHOTOGRILL: What was your subjects reaction to the hack? PHOTOGRAPHER: The bees didn’t like it too much, too intrusive. I think Matt and Vanessa thought it was a bit odd at first, until they saw some early images on the cameras digital screen. Then they were happy to spend more time to make it work. Just as well I only have one deadline a week. This entry was posted on Sunday, February 27th, 2011 at 4:57 am. 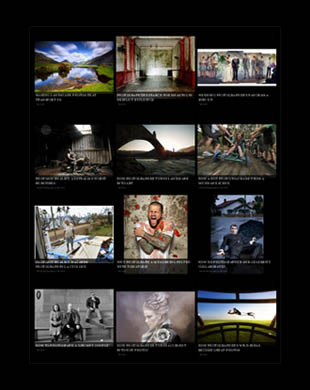 It is filed under Fairfax Photographers, The Grill and tagged with Macro Photo, Nature Photo, Photographic Techniques, Posts Tagged ‘Landmark Photo’. You can follow any responses to this entry through the RSS 2.0 feed. Thank you so much for this fast and friendly reply Craig! Hi Christian, thanks for your comments. I’m afraid I do tend to assume that readers already know a certain amount. However nobody should let that put them off. If a technique we talk about is a bit confusing, please feel free to ask questions. Also there are plenty of places to polish up on the photography background, in this case macro-photography. Here’s an excersize to try which should help. Take your standard lens off your SLR camera and hold it a small distance in front of the camera, try to block stray light with the hand that’s holding the lens. Now if you look through the viewfinder you can move much closer to your subject. Macro lenses are made to do this without removing the lens, but you can’t get a super-wide-angle macro. Craig. Definately another one of my favourite shots! Way too close for comfort the bees though!